Home » Blogs » AnnMaria » What Exactly Did You Expect from Start-up Life? What Exactly Did You Expect from Start-up Life? Recently, I had lunch with someone interested in founding a start-up. She asked me how much time I was able to spend on development each week, as opposed to meeting with investors, interviewing prospective employees, budgets, etc. She’d heard of founders who started a company because they wanted to develop this great product idea and then spent all of their time raising funds and managing the company with no time left for the design or development that got them excited in the first place. He is well worth reading. His point in that essay is that no one is good at everything. I would add that creating a company is more than a one-person job. I went on to add that 40-50% should be taken in the context of the fact that I work 70+ hour weeks. So, I’ll spend 30-35 hours on budgets, meetings, contracts, answering email and general management stuff and another 35-40 hours on development. That’s a lot of hours, she said. Which left me wondering – what did you expect? 7 Generation Games is not yet four years old. We are growing and building but we still have to bootstrap the company to a large extent. That means a lot of the time each of us are doing two jobs. Maria is CEO but also doing marketing and writing contracts and game design. I’m balancing budgets and interviewing for developer positions and writing code. Dennis is creating levels in Unity and writing documentation and maintaining our servers. I’ve said it before and I’ll no doubt say it again. Succeeding in start-up world doesn’t just take working a crazy number of hours a week, but it takes working those crazy hours for far more months than generally believed. 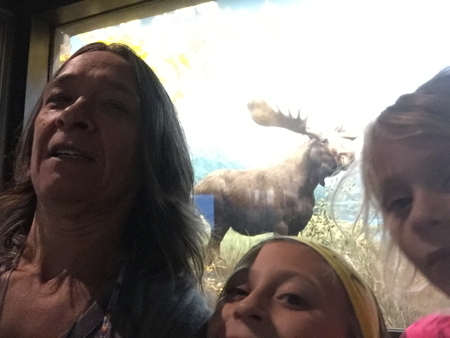 To avoid burn out, I recommend taking some time out every now and then to do something completely different, like go to the Natural History Museum and take selfies with a stuffed moose. When you feel like taking a break, check out Fish Lake. Runs on Mac and Windows computers. Teaches fractions, Native American history and canoeing down rapids in a virtual world. ← Throwback Thursday: Learn How!